Aligarh: The Department of West Asian and North African Studies, Aligarh Muslim University today inaugurated a three-day International Seminar on ‘Changing Geo-Political Architecture of West Asian and North Africa: Implications for India’ at the Conference Hall of the Administrative Block, where delegates and faculty members discussed regional complexities and rising expectations from West Asia and how New Delhi should analyse relations with GCC countries. 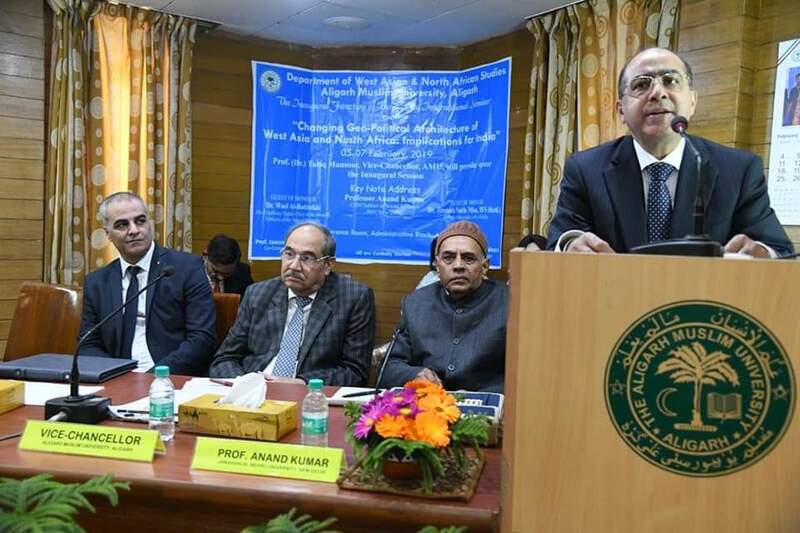 Giving his remarks, AMU Vice Chancellor, Professor Tariq Mansoor said that West Asia and North Africa has its importance all over the world because of its resources and the fact that it is the birth place of Islam, Christianity and Judaism. He added that United States of America, Iran, Kingdom of Saudia Arabia, Russia, Turkey and Israel are important players in the region because of strategic reasons. “While the USA is important in the region because the Middle-Eastern countries depend on USA for investment and security; Iran with its religious ideology followed in Iraq, Lebanon and Bahrain is important; Saudia Arabia is important because of its economy; Russia is a new player in the region, which came after the vacuum created by the previous USA regime; the influence of Turkey is vital as it has the largest army in NATO and Israel is always going to protect its interests in the region,” said the Vice Chancellor. In the keynote address, Prof Anand Kumar (Jawaharlal Nehru University, New Delhi) said that West Asian and North African region has a historical and cultural connection with India. He advised research scholars attending the seminar to focus on connection between West Asia and India in terms of finance capital, trade community connection, technology exchange, labour market and media. However, Prof Anand Kumar lamented that despite a history of cultural connections and the presence of a huge Indian diaspora in Middle-Eastern countries, not many Indian universities have departments of West Asian studies. Delivering the inaugural address, the Chief Guest, Dr Jitendra Nath Misra (IFS retd) emphasised that India’s diaspora affects its role in a multipolar Middle-East. “India’s presence in the Gulf is distinctly shaped by its massive expat community. India’s diaspora in the Gulf has of course always been important to the country’s economy as India’s most distinct soft power assets is the diaspora and its role in buttressing a positive image of the country,” he said. Speaking on the history of India-Palestine relations, the Guest of Honour, Dr Wael Al-Battrekhi (Deputy Chief, Mission Embassy of the State of Palestine) pointed out that India-Palestinian relations have been largely influenced by the independence struggle against British colonialism and India recognized Palestine’s statehood following declaration on 18 November 1988. 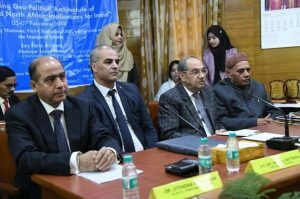 “Although relations between India and PLO were first established in 1974, India’s principled solidarity with the Palestinian cause has been there since the days Mahatma Gandhi, said Dr Al-Battrekhi. Prof Ghulam Mursaleen (Convenor of the Programme and Chairman, Department of West Asian Studies) delivered the welcome address, Prof Jawaid Iqbal (Co-Convenor) also spoke on the occasion. Prof S Shamir Hasan (Dean, Faculty of International Studies) proposed the vote of thanks. Delegates from various Middle-Eastern countries, Turkey, Malaysia and Thailand are attending the three-day seminar.